What a stressful city we live in! I know of some people who love getting regular massages to de-stress and relax from the hustle and bustle of the Lion city. Personally, I find them too expensive in Singapore! Of course, I am comparing to the 200-300 baht 1hr massages you get in Thailand. Fine, I'll be realistic. Let's localize the context. 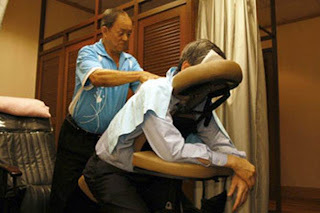 Now, where can you find cheap and good (... stop glaring, I am talking about a good ol' traditional massage) massages in Singapore? Lifehacksg#9 reveals a great opportunity for you to get a (cheap) massage... with a heart! Recently, I stumbled upon the Singapore Association for the Visually Handicapped, located right opposite the new Caldecott station on the Circle Line. SAVH is a national voluntary welfare organization that promotes the needs, interests and welfare of the visually handicapped in Singapore. Their trained masseurs are available daily to provide massages to walk-in customers. It will cost you $10 for a 20-minute massage and $15 for the 30-minute session. For the latter, we're looking at just $5 per 10 minutes for a really relaxing experience; please tell me if you can find a better deal right now in Singapore. Plus, you're helping to provide more job opportunities for the visually handicapped masseurs working there. Taking the (-)cost and add a (+)intangible social contribution, I could argue that you're seemingly being paid to get a massage! Although I was in a rush that evening, I decided to try the $10 option, and my masseur gave me an amazing 20-minute head+shoulder+hand massage. Besides working weekly schedules, the masseurs also work on the mobile massage team (shout-out for corporates looking to get involved!). p.p.s. like our Facebook page if you haven't already! A massage chair makes massage easier. Specially a vending massage chair makes a massage more affordable.